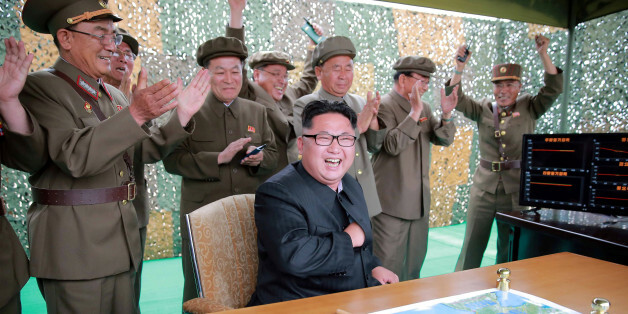 North Korean leader Kim Jong un reacts during a test launch of ground-to-ground medium long-range ballistic rocket Hwasong-10 in this undated photo released by North Korea's Korean Central News Agency (KCNA) on June 23, 2016. REUTERS/KCNA TPX IMAGES OF THE DAY ATTENTION EDITORS - THIS PICTURE WAS PROVIDED BY A THIRD PARTY. REUTERS IS UNABLE TO INDEPENDENTLY VERIFY THE AUTHENTICITY, CONTENT, LOCATION OR DATE OF THIS IMAGE. FOR EDITORIAL USE ONLY. NOT FOR SALE FOR MARKETING OR ADVERTISING CAMPAIGNS. NO THIRD PARTY SALES. NOT FOR USE BY REUTERS THIRD PARTY DISTRIBUTORS. SOUTH KOREA OUT. NO COMMERCIAL OR EDITORIAL SALES IN SOUTH KOREA. THIS PICTURE IS DISTRIBUTED EXACTLY AS RECEIVED BY REUTERS, AS A SERVICE TO CLIENTS. 북한은 3일 오전 7시50분께 황해남도 은율 일대에서 동해로 탄도미사일 1발을 발사했다고 합동참모본부가 밝혔다. 이번 발사는 지난달 19일 노동미사일 2발과 스커드 미사일 1발을 발사한 이후 15일만이다. 북한은 경북 성주지역에 배치하기로 결정된 고고도 미사일방어체계(사드)를 무력화할 수 있다는 자신감을 과시하고, 남남갈등을 유발하기 위한 무력시위 차원에서 미사일을 발사한 것으로 군 당국은 분석하고 있다.